We've had an exciting month. Not only are we now under brand new ownersip, and have embraced seaside living with new offices down in sunny Bournemouth, there have been some changes to the team as well. We say a fond farewell to our interim editor, although Charles will still have close links with Inside Crochet, and are really excited to announce that Claire Montgomerie will be returning as editor from next issue.So it's been eventful here but we can honestly say that the future is looking eceptionally bright, not least because summer has finally arrived!July is often the hottest month of the year in the UK, so we've packed this issue with patterns designed to make the most of the sun while it's here, such as Nicki Trench's blossom shawl (page 25), Erika Knight's freeform camisole (page 34), the zesty lemon skirt (page 84) and the summer breeze shrug (page 20).For those of you with a mind for mathematichs or 'geek crochet', Andrea Lyn Van Benschoten has put together an insight into the art of the Mobius on page 76, while knitwear designer and eassayist Rhon Strong tells us about hs twin passions on page 56.Happy hooking! 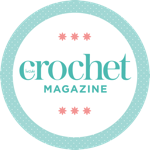 As well as 12 fantastic patterns, we get to know Rohn Strong, teach you how to make your crochet pay and learn the art of the Mobius with Andrea Lyn Van Benschoten.